Intestinal Dysbiosis is an alteration in the balance and composition of intestinal bacterial flora, which causes a series of symptoms and gastrointestinal disorders, which can also affect organs and apparatus that are distant from the intestine. In the gastrointestinal tract there is an organ called the Microbiota, formed of a number of microorganisms that form the bacterial flora. The type and number of intestinal bacteria go to determine the state of health or otherwise of the digestive tract and the entire organism. The Dysbio Check reveals two metabolites of tryptophan in the urine, called Indican and Skatole, and enables checking whether there are fermenting and/or putrefactive processes underway in the intestine: a high level of Indican in the urine is an indicator of intestinal dysbiosis in the small intestine, while high levels of Skatole indicate intestinal dysbiosis in the large intestine. 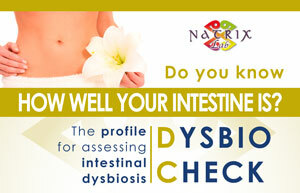 Intestinal dysbiosis can be shown with a wide range of symptoms. Poor digestion, with alterations in the intestinal tract (frequent constipation or diarrhoea, meteorism, irritable colon, irregular bowel movements). Bloated or tense stomach, stomach pain, flatulence, general sense of discomfort or indisposition. Increased susceptibility to infection due to reduced immune defences. Increased probability of intestinal mycosis (candida), vaginitis and cystitis in women. 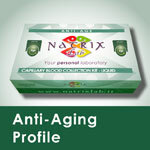 General disorders: nervousness, anxiety, sleep disorders, tiredness, asthenia and mood swings. Before beginning treatment based on lactic ferments, to choose the probiotic and prebiotic that are most suitable according to the test results. 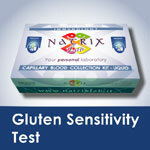 After treatment based on lactic ferments, to evaluate the success of the treatment. 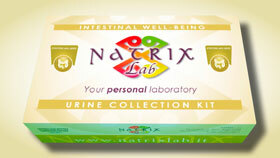 The test is by analysing a urine sample, and can be requested in analysis laboratories, medical centres, health spas and pharmacies that offer NatrixLab diagnosis services. Preparing for the exam: collect the samples at least seven days after the last antibiotic therapy. The urine should be of the first morning. In the case of intestinal dysbiosis, the results should be followed by a careful study of the person’s clinical history and by additional tests to evaluate the symptomatology aetiology. Correct diet helps improving the symptomatology and rebalancing the intestinal bacterial flora to reinstate its eubiosis. 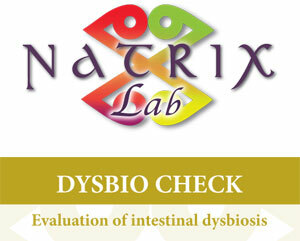 The NatrixLab Dysbio Check gives precise indications about which stretch of the intestine has unbalanced bacterial flora, which enables identifying the most suitable diet and probiotic treatment for each specific case. In particular. Altered Indican levels are an indicator of dysbiosis in the small intestine (fermentative intestinal dysbiosis), where it is advisable to supplement with a specific stock of probiotics and a low fermentation diet. Altered Skatole levels indicate dysbiosis in the colon (putrefactive intestinal dysbiosis), where it is advisable to integrate with a specific stock of probiotics and a diet able to promote digestibility. If both levels are altered, it indicates intestinal dysbiosis in both the small intestine and the colon, making a treatment with a different stock of probiotics advisable. If the result is positive, we recommend repeating the test after 2-3 months, when you have finished the treatment using supplements and a correct diet. 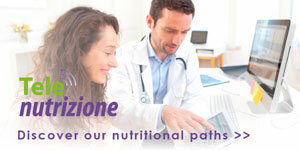 To monitor treatment or a pathology, we recommend repeating the test according to your doctor’s instructions. 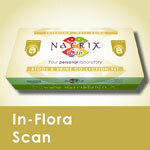 “In Flora Scan” is a complete test that is useful to evaluate the flora, any inflammation in the intestine, digestive capacity and intestinal permeability. Turner, N.D., Ritchie, L.E., Bresalier, R.S.& Chapkin, R.S. “The microbiome and colorectal neoplasia: environmental modifiers of dysbiosis.” Curr Gastroenterol Rep 15, 346 (2013). Schrezenmeir J de Vrese MM. Probiotics, prebiotics, and synbiotics-approaching a definition Am J Clin Nutr 2001; 73 361S-364S. Cummings JH, Macfarlane GT. Role of intestinal bacteria in nutrient metabolism. JPEN J Parenter Enteral Nutr 1997;21:357-365. Cui, S.& Hu, Y. Multi strain probiotic preparation significantly reduces symptoms of irritable bowel syndrome in a double blind placebo controlled study. Int J Clin Exp Med 2012; 5,238-44.